My sister always said, she could live on Asian-inspired cuisine. I can’t blame her, since I’m lucky enough to live in an incredible area where influences from all over the world are right at my door step. 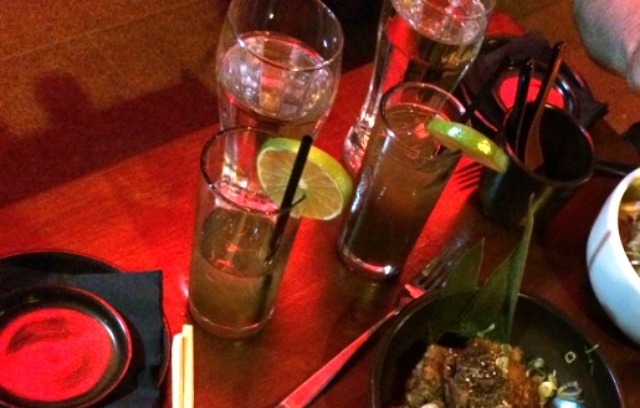 Looking to explore a new taste, we happened upon Kinjo in Fort Greene, Brooklyn. Self-proclaimed a “new Japanese fusion concept, incorporating the best of western and eastern cuisines,” these guys nailed it. Their menu is fresh and unique with many items I had never ever seen offered before. We dove right in and were plesantly surprised. We started out with a couple of Yuzu Brown Sugar Limeades — super sweet and super refreshing. 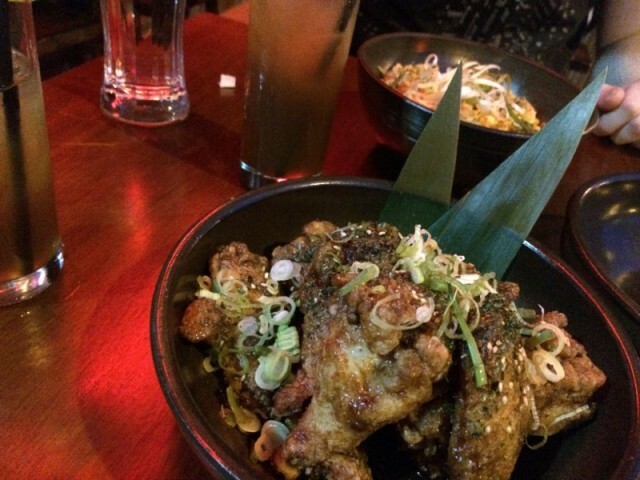 Those came in handy with the appetizers we ordered, the Garlic Chili Glaze Chicken Wings. I know what you’re thinking, “the blasphemy!” Especially hailing from Buffalo, it’s not often I have faith in wings outside of Western New York. But these being so far from the original, we could’t say no. I’m glad we didn’t. The flavor was so bold — a winner when it comes to creativity. For the meal, my boyfriend went with the Shifudo Ramen which included a spicy miso broth with mussels, shrimp and squid. Intense is a good word to describe it with whole shrimp looking at you from the bowl, it was a lot “fresher” than we were expecting, but satisfying. I added a spider roll to the mix, which was big enough for a meal on it’s own. Then with a bit of luck getting a newer waitress, we were mistakenly given a bowl of Spicy Basil Fried rice (which they gave to us on the house despite the mix-up). A welcomed addition to our meal, the rice had great flavor and taste, plus leftovers for the next day. 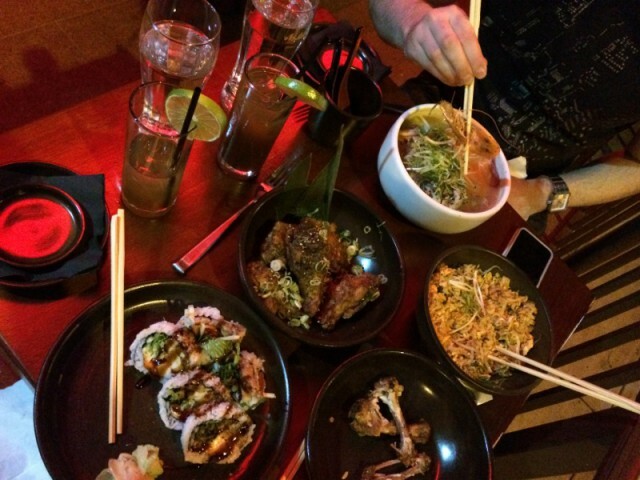 Overall, Kinjo was definitely a place we were impressed with. The killer menu included additional items we would go back for in a heartbeat, which can be rare. Their spin on classic Japanese cuisine was a hit and great to see new restaurants looking outside the box for inspiration. Tags: Asian, Asian fusion, BROOKLYN, chicken wings, Fort Greene, fried rice, Kinjo, limeade, LOCAL EATS, RAMEN, ROOKIE CHEF, seafood, Sushi. Bookmark the permalink.